Gulf Shores Alabama House For Sale at The Peninsula. This incredible well maintained and furnished property has approximately 2,040 sq. 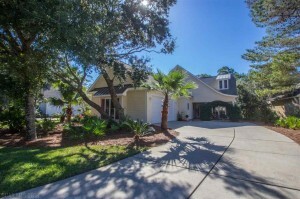 ft. and is located in the desired gated golf community of The Peninsula; the home features three BR’s and two Bath’s, a spacious Master bedroom with new flooring and opens into sun-room, as does the living area. Master bath includes double-vanities and two walk in closets. Open concept is ideal perfect for entertaining family and friends – the outdoor enclosed pool and lush landscaping is inviting. All appliances convey including the clothes washer and dryer. Social Club Membership is included in monthly dues – come see this beautiful residence.